the Barcelona manifestation, thank you. Those we can not go we give our full support. all the Catalans around the world. que pugueu anar a la manifestació de Barcelona, gràcies. Els que no hi podem anar us donem tot el nostre suport. tots els Catalans d'arreu del món. Thank you Beck for visiting me in my world of wool! Thank you for your comments! Thank you for following me! You too have a blog with beautiful things! Gràcies pel teu comentari i, com et dic al teu blog, fas unes coses precioses! Nosaltres hi erem, tots 5. No tinc paraules, va ser molt emocionant. Gràcies, Belen, pel teu comentari. Hi Cristina, Greetings from India. I am your new follower. I love the beautiful colors you use for your crochet. Do you know I started my blog in May 2012 and as of today we both have 47 posts! Isn't that strange? I hope to learn more about Catalonia from you. Let's have fun crocheting together. Thanks for visiting me and follow me! Yes it is a coincidence, we both started the blog in May and have the same posts! I also think that Lucy's Attic24 is great! You also do beautiful things, hexagon blanket is very pretty. Many thanks for your nice comment! And come visit me whenever you want, I're grateful. 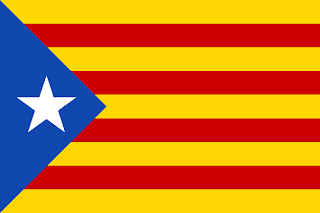 Congratulations on the National Day of Catalonia! This is the first time I learn about Catalans, it's thanks to you! Also thank you so much for the sweet comments on my blog! I'm very happy to have you around! Thank you for your comment! I am happy that you have met the Catalans. I am very happy to know that someone has seen Sai Gon Catalans thank me! Thank you! OOHH Cristina com m'ha agradat veure l'estalada!!! fent país!! jo vaig anar a la mani amb tota la famíly i va ser molt bònica i emocionant!!! espero que tinguèssis una feliç diada!